Not only do we get to time travel to 1815 to meet Jane Austen, but the time travelers are also from our future, adding another layer of interest. Going back to 1815 is quite a shock for them, but they have been preparing for this trip for a long time. Their mission: to steal the finished manuscript of The Watsons, and to try to determine the cause of Jane Austen’s death. But how prepared can you really be for a world so different from your own? It was fun watching Rachel and Liam negotiating with each other and with this new world; trying to fit in seamlessly, but doubting their ability to do so along the way. For Rachel, it was hard for her to allow the men to act and think first while staying demurely in the background. But how ghastly to be a woman here, I thought, as I realized that even I, who should know better, was thinking of them only in reference to men: those they would marry, or those they might wish to. As well as being on top of their game all the time, and never letting their guard down, they also have to be careful not to do anything that might significantly alter the future. But how to know what will be significant and what will not? They will have to wait and see what damage they’ve done when they get home… if they ever get there. I thought how our cells are constantly dying and being formed anew, and that the longer I stayed here, the more I was becoming a product of 1815. 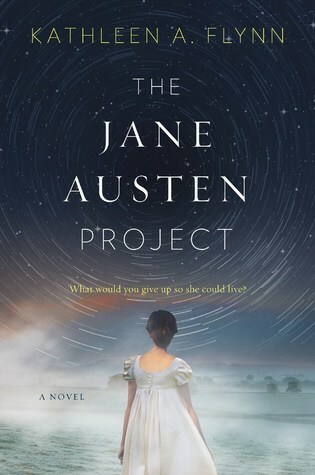 If you’re interested in learning more about The Jane Austen Project or about Jane Austen’s abandoned book The Watsons, see Kathleen A. Flynn’s guest post on Sarah Emsley’s blog. Have a look at Kathleen A. Flynn’s Jane Austen Reading Project. I’m especially interested in the “somehow relevant fiction” section. Have you read anything from this list? What are your favourite Austen-related books? Sounds fun! The best Austen spin-off I’ve read is Longbourn by Jo Baker, which is P&P from the servants’ perspective. I have that one – just haven’t read it yet! I’m glad to hear you liked it! This is on my TBR. I’m so glad you think it’s worth it! Austen spin-offs can be iffy sometimes. I must have this book! Love the cover 😊 And time travel! And Austen! I have followed Flynn’s blog but not read the book yet. It sounds exciting, no doubt. I’m not one to jump into any Jane Austen related book there is, but this one is a winner! This is good for anyone who likes Jane Austen, historical fiction, or time travel. It’s amazing to think that a writer from 200 years ago is still so popular! I’m so glad you enjoyed this! I loved it. Fascinating to watch as Rachel and Liam discover how inadequate their preparations were. I’ve read several of the books on the “Somehow Relevant” list; one of my favourites is Tracy Chevalier’s Remarkable Creatures. Really, it’s surprising that Rachel and Liam were as prepared as they were, because there were so many things to consider – things I never would have thought of. I was nervous the whole time about their money. It was so much fun! I don’t know. This sounds sort of intriguing and doubtful all at the same time. It would depend on how good the author is at depicting Austen’s world, I guess. I thought the author handled all of it well – the time travel, the characters, Jane Austen, 1815. I’d love to hear your opinion on it! OK, I’ll put it on my list. Might be a while, though. Thanks so much for this lovely review! And for the shoutout to my reading list! Brilliant post! Jane Austen is my favourite author! I’ve read all her novels many times! You’ve convinced me that I need to read this too! I haven’t read that one. Would you recommend it? I would. Very funny. The Eyre in the title is Jane Eyre. The writing was much like Douglas Adams. This one is the first of a series featuring Thursday Next. He also has a series based on nursery rhymes. What got me hooked was I saw him in an interview. Very entertaining for a writer. This sounds like a fun read! I’m going to have to check it out! (I agree that it sounds a little bit like “The Eyre Affair,” but just different enough that I’d love to dive into that world). Aw, fun! I haven’t read a ton of Jane Austen related books, but I did read a terrific book called What Matters in Jane Austen that was really enlightening — it talked about death in Jane Austen in a way that I really hadn’t thought about before. I also have this book called Jane’s Fame that’s about how her reputation changed and spread throughout the centuries, which looks super interesting, but I haven’t read it yet. The author of What Matters in Jane Austen was just in Halifax for a Jane Austen conference, and I went to hear him speak a few nights ago! He was a great speaker. I’m glad to know you recommend his book! John Mullan’s What Matters in Jane Austen is a splendid book. So glad you enjoyed his lecture last week, Naomi! I did, too. I liked The Jane Austen Book Club and have Mullan’s “What Matters” on my wish list, too. Apart from that, I don’t really like sequels etc – but this looks like FUN! I like Flynn’s “somehow relevant fiction” section. Wow she has great lists on Austen. I didn’t realize A Wrinkle in Time is relevant. Off her list, I really enjoyed Eligible by Curtis Sittenfeld. Funny! Makes me want to read some of them to see how they’re relevant! Back to the Future meets Jane Austen. Cool!